A new title with the aim of encouraging beginners and new riders. On2Wheels is a free pick-up newspaper that brings together all the information and advice needed for those starting out. Features in the debut issue include advice on moving through the licence categories, improving riding skills, saving money and buying the right kit. 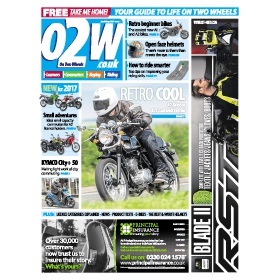 The publication's new editor Mau Spencer said: "Our inspiration was to do exactly what it says on the cover... get more people on two wheels, whether it's scooters or motorcycles. You could be starting out for the first time, a former rider looking to get back on the road or someone wanting to take steps towards a full A licence. Wherever you are on the journey, O2W is the inspiration you've been waiting for."